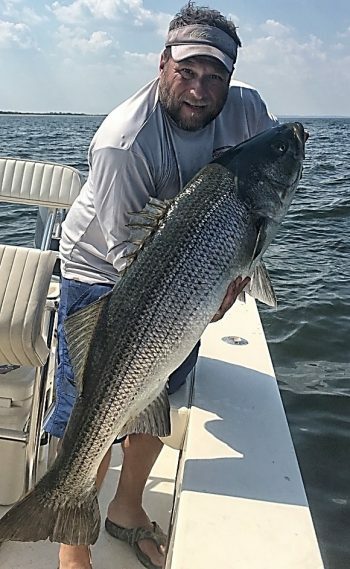 If you are a striper fisherman, unless you’ve taken some sorta sabbatical from social media, I’m guessing you’ve heard about the downright epic fishing off the Jersey Shore right now. I mean, complete insanity. Above: Capt. Jason Dapra. Top: Adult bunker equal big bass. He’s right… It doesn’t… At least not without the sort of large, dense aggregations of menhaden we’ve seen in the last few years. These fish don’t just randomly show up… They are unequivocally here because of menhaden (bunker) concentrations. Anyone with even a cursory understanding of the striped bass fishery knows this is indeed the case. Bunker bring in fish. 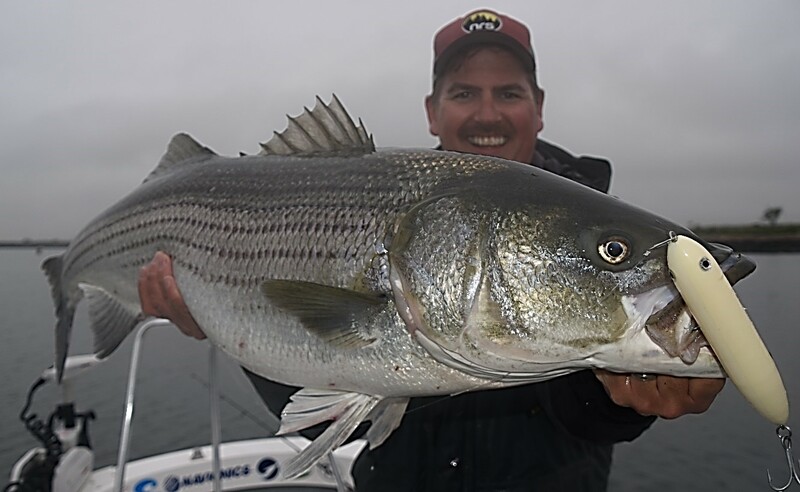 Not finicky small fish, but big stripers, often crazy-big. There are dozens of charter boat captains in the region that make a living on such aggregations. Because, for one, they make fish stupid… Not only is there a solid live bait fishery, but also when bunker are around in extraordinary numbers, outsized stripers will often crash topwater plugs, and sometimes even flies. And THAT is just awesome in a way I can’t describe here. Yes, there are often other bait species around, but they just don’t bring in stripers like oily, adult 10″ menhaden do, nor do they create the same sort of action we’re seeing, right now. While there are certainly those who will try to dispute this point, it is a FACT that menhaden are critical to such adult stripers, not to mention all the small businesses that thrive when they are around. It’s not even just the striped bass these adult bunker draw. It’s the myriad of marine and bird life that comes to feed on them. I mean, Nat Geo type stuff. The kind that makes jaws drop. In recent years, it’s become an almost regular occurrence to have gigantic humpbacks come up 20′ or 30′ away from you, mouth agape, as bunker spray out the sides… Often so close you can smell their breath (which is not pleasant, by the way). And there are prolific whale-watching operations as a result. Thresher sharks have become fairly abundant amongst such menhaden schools as well. In fact, for better or worse, there’s a legit thresher shark fishery in 40′ of water off Rockaway, NY in June and July where none existed before we starting seeing such big aggregations of adult bunker. And the birds? Witnessing several dozen gannets dive-bombing schools of adult menhaden is just freak’n’ awesome. Osprey abundance in the region can be directly correlated to menhaden abundance as well. Certainly we’ve always had bunker here. Some years in pretty good numbers, other years not so much. But their recent “super” abundance (over the last several years) is hard to ignore. Most of the guys who have been around way longer than me say they’ve never seen so many. It’s intuitive really that a 20% reduction in harvest managers mandated back in 2012, on what was a basically unregulated large scale/low value fishery, is the primary reason. Of course, the menhaden industry would argue it has more to do with favorable environmental conditions for good “recruitment” (aka spawning success). But as I’ve said here before, if you leave hundreds of millions of pounds of fish in the water, well, there will be hundreds of millions more fish in the water. Right? Certainly that 20% reduction has something to do with such aggregations here and elsewhere. Personally, I think it has everything to do with them. Since then, however, industry has gained back 16% because of a new stock assessment that surprisingly doesn’t account for predator-prey relationships in a meaningful way. Of course because of the perception, and the very real fact that there are more fish around now, there are some managers who believe that the large-scale reduction industry should have access to them, and to hell with everyone else. And almost undoubtedly, industry will ask for more next year. Fortunately, managers have embarked on an amendment to the Menhaden Fishery Management Plan which would for one, look at state-by-state quota allocations. Frankly it’s bull(expletive) that VA – home of the last remaining menhaden reduction plant (Omega Protein) – gets 80% of the quota while the rest of the states get scraps… But that’s an entirely different blog. For the purposes of this blog, and menhaden aggregations like the one we’re experiencing now, what’s truly important is that the amendment includes options for managing menhaden in an entirely different way than they are managed now. Instead of managing them in a single-species context (i.e. how many we can take out and still have the stock reproduce) it just makes sense to manage what author Bruce Franklin calls “The Most Important Fish in the Sea” in an ecosystem context (with an emphasis on how many we should be leaving in the water for everything else that eats them…). I’m not going to get into the details of the amendment. But if you want to take a look, you can find it here: Menhaden Amendment 3 Public Information Document. Brass tacks is as anglers we should be firmly behind Option D: Existing Guidelines for Forage Fish Species Until Ecosystem Reference Points are Developed. A working group composed of fishery scientists is diligently working on a way to manage menhaden relative to the ecosystem, but in the meantime there are well established criteria for managing forage stocks such as menhaden. It’s really as simple as leaving 75% of an unfished stock in the water and shutting the fishery down if it goes below 40%. Seems entirely reasonable for a stock so important to everything else. Undoubtedly, industry will argue for waiting for the menhaden-specific ecosystem reference points, which will likely take several years, if not more, to get right. And while we delay, I’m pretty darn sure that industry will argue for jacking up the quota. And every year we’ll have to fight it. And meanwhile, during all of this, Omega Protein has invested in Marine Stewardship Council (MSC) certification. In other words they want their product certified as sustainable and environmentally benign. Where this shakes out is anyone’s guess, but how on earth a fishery that scoops up hundreds of millions of pounds of forage fish out of the ecosystem is environmentally okay, is frankly beyond my understanding. I suppose we’ll see where that goes. While I have yet to see the agenda, a critical decision on Amendment 3 will be made at an ASMFC meeting during the first week of August (1st to the 3rd). We’ll likely need A LOT of anglers to engage prior to that meeting. So stay tuned on how to do that. In the meantime, it’s critical that not only the fishing public, but the general public understand the importance of menhaden aggregations, and the fact that they’ve come back in spades since the 20% reduction in 2012. It’s important that everyone understand that menhaden need to be managed for their ecosystem benefits… Not simply so one company in one state can harvest huge amounts at the expense of everyone else. NY Governor Andrew Cuomo has shown an interest in whales, and good on him for that! But it’s critical that he and the general public recognize that the ONLY reason they are here is because of the menhaden. They matter to those whales, the striped bass, the gannets, the ospreys… Equally important, they matter to all the small businesses up here that greatly benefit from large aggregations. I do hope the Menhaden Board understands that.